The beauty of bespoke pieces is that they are created around your ideas, your style and your budget, so your design will be one of a kind and completely personalised for you. Designing a bespoke piece is a process, and starts with your ideas, no matter how vague they may be. From there, we work together to pick out colours and details you love and then those initial ideas are transformed into wearable art. It also means that you can find out what would work best for you and make adaptations if you need to. You can add in sentimental pieces of jewellery or incorporate your something blue…your accessory is built completely around you. 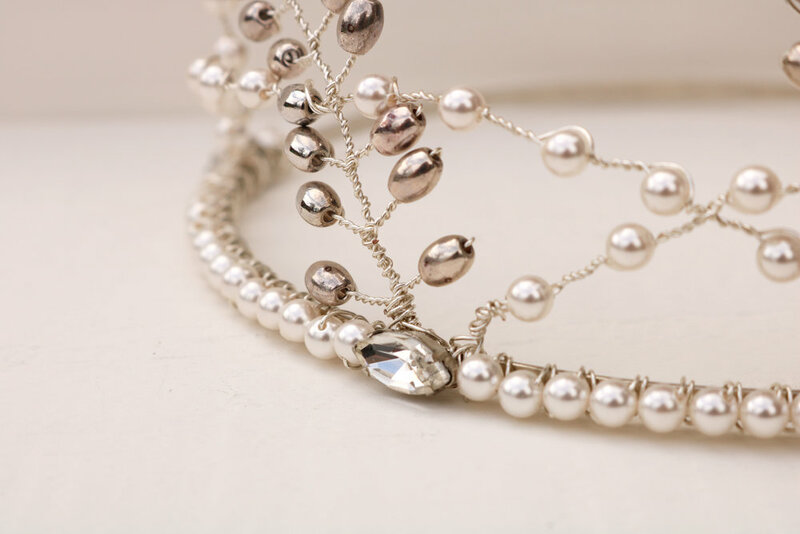 Your accessory can be made from gold, silver, copper or rose gold wire and consultations are complimentary, giving you the chance to ask any questions and see examples before you buy. I’ve had the pleasure of adding the finishing sparkle to brides all around the world and I’d love to do the same for you. To find out more and get started, click below to arrange your free consultation. — Tracy, Elsa Rose Bride. "Thank you so much Sarah for the things you made me, they are absolutely beautiful. Excellent customer service too!" — Angela, Elsa Rose Bride.